Jungle’s Edge is Costa Rica’s premiere All Inclusive Lifestyle Retreat Center. Our lifestyle includes Yoga, Mobility Training, Weight loss, Brazilian Jiu Jitsu, Kickboxing, MMA, and Surf School. Make new friends and surely your stay will leave you with sweet memories for a lifetime. Our facility is nestled mere minutes from Playa Guiones, a world-renowned surf destination, and tucked away into the jungle, making it the perfect setting for retreats of all varieties. Nutritious gourmet cuisine, accompanied with fresh juice detoxing, is prepared daily for our retreat and surf camp members. Our oasis is made up of multiple organic gardens, hundreds of banana trees and luscious flowers, making it the perfect getaway. Jungle’s Edge is the "oasis" you have been dreaming of. We host several retreat types including Yoga, Mobility Training, Weight loss, Brazilian Jiu Jitsu, Kickboxing, MMA, Surf School and private groups. Our all-inclusive retreats for solo travelers and groups are taught by highly trained practitioners that live right here in Nosara and can be joined any time of year. We are also a host facility to some of the best studios and instructors from around the world for groups of yoga, martial arts and much more. We welcome you to create a custom retreat for your group with our teachers, or your own. Costa Rica is a place that captures people and once they have experienced the magic they never let it go. We attribute this to the clean air, high-quality water, endless amount of activities and sights to see plus the overall happiness and enjoyment of the local culture. The Costa Rican people live a life style of Pure Life, or as they say, Pura Vida. We have embraced this and live it each and everyday. Costa Rica is home to incredible surf, amazing scenery and settings for yoga and some of the nicest people on the planet. Jungle's Edge is peacefully nestled on the outskirts of the Costa Rican jungle. We have taken many precautions to preserve the water, wildlife and plant-life of Costa Rica was maintaining a beautiful and highly efficient retreat center. Our grounds have a custom water drip system and our well is one of the deepest in Nosara, providing our plants and guests with some of the cleanest water in the world. We take many measures to be eco-friendly including an organic garden, energy efficient light bulbs, onsite compost, biodegradable trash bags, and we strive to use our own organic cleaning products as much as possible. We also boast a giant salt-water pool that keeps chemicals away so you can enjoy a safer swim. We support many local organizations including the Costas Verdes Project, Nosara local school and Nosara Recycle. We are also a Trip Advisor Green Leaders Bronze Level. Nosara, where Jungles Edge is located, is a gorgeous beach town of Guanacaste in the Nicoya Peninsula of Costa Rica. The peninsula is home to some of the best surf breaks in all of Central America. The varying angles of the local beaches capture swells from all possible directions; leaving us with waves nearly 365 days a year! As one of only a handful of Blue Zones on the planet, the Nicoya Peninsula is home to some of the healthiest and longest living people in the world. It is not uncommon for those living in this zone to live longer than 100 years, making a strong case for the food and water quality. Locals live off the sea and the land, farming and harvesting high quality fruits and vegetables that have the vibrant colors we all dream of. The Costa Rican community, especially evident here in Nosara, have built a strong sense of unity. From an outsider seeing the dirt roads, albeit some of the last unpaved areas in the country, Nosara may seem undeveloped. This town is far beyond others around it and is truly a magical place. From the beaches to the restaurants Nosara is sure to impress. At Jungle's Edge, we pride ourselves on customer service and treating each guest and staff member as family. Whether you are staying for one night or one month, you will be taken care of with tremendous passion and hospitality. While we are no small retreat center, we still feel it is necessary to keep the core values we started with when Jungle's Edge was just an idea. Family, tranquility, health and happiness are embodied by everyone here. Since his first practice, Javier knew that he would be doing Brazilian Jiu-Jitsu for the rest of his life. Ups and downs along the way, overcome injuries, disappointments but also a celebration of all kinds of triumphs; understanding that all the emotions are part of this martial art. Javier enjoys to practice Jiu-Jitsu and Mixed Martial Arts as it improves his life in all areas and he gets to know different people from around the world that share the same respect and feeling for BJJ. All ages are welcome to come and train with us at this paradise and have a good time. 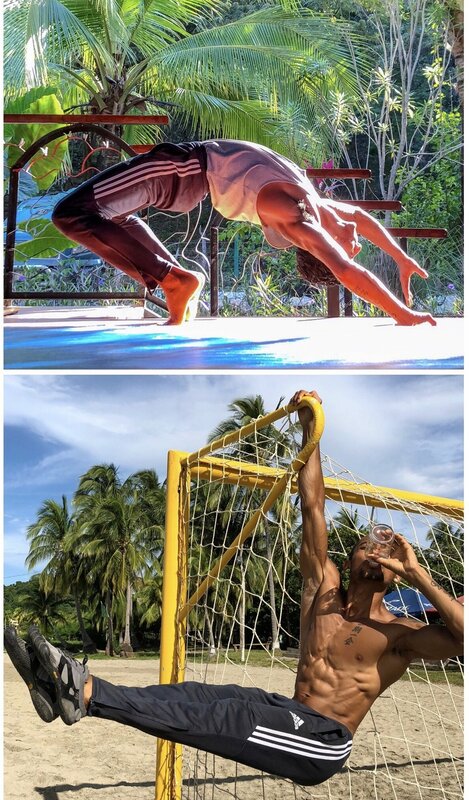 Brazilian, 31 years old, started practicing yoga 10 years ago. Since 2015 she has been teaching Yoga and Meditation classes (mindfullness) in the areas of healing with ayurvedic therapy, self-knowledge psychology, permaculture, sustainability and human values. Elaborates transdisciplinary projects with food education and permaculture. For the sake of surfing practice she integrated yoga on top of a surfboard (supyoga). At this point in her career, she plans to develop yoga retreats around the world and for needy communities. Currently making Jungle’s Edge her home.